Remove from the oven and carefully position a rack about 6 inches from the broiler and preheat on low. 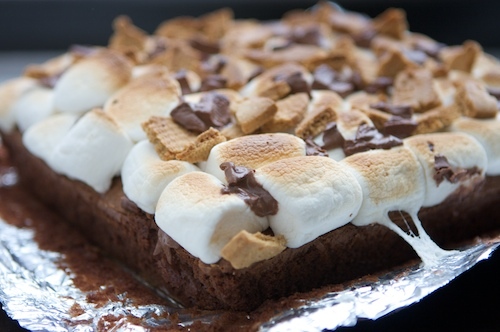 Layer marshmallows across the top, sprinkle with chocolate chips and graham cracker pieces and toast under the broiler until golden, (keep an eye on it, it can go quick), about 2 minutes. Cool on a rack, gently removing the brownies from the pan using the aluminum flaps. Carefully separate any marshmallow from the foil and fold away. Cut into squares.